We're big fans of Choice Provisions and its BIT.TRIP series, in particular the recent BIT.TRIP Presents: Runner 2 Future Legend of Rhythm Alien. 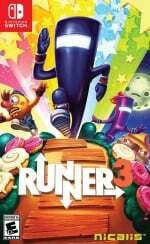 During today's Nindies Showcase it was revealed that the aptly-titled sequel Runner3 will be headed to the Nintendo Switch eShop this Fall (Autumn), described as launching 'exclusively' on the system. Runner3 follows the continuing adventures of CommanderVideo and all his creepy friends. Their arch-rival, the Timbletot, is determined as ever to rid the multiverse of all its love and happiness. CommanderVideo, a lover if ever there were one, refuses to let this happen. He's ready to jump, double-jump, wall-jump, slide-jump, underwear-jump, slide, kick, float, fly, and dance his way to victory, all across a medley of thrilling, challenging, and joyous levels! We're really looking forward to this one. Stay tuned for more Runner3 news as we have it. Loved Runner 2, but never went far beyond the first World. Does it mix it up much after that? @gcunit Not too much. It does introduce new gimmicks and challenges, but the game definitely needed something more. At least Runner 3 seems to change that. Not quite as charming as the original (have said the same about Runner 2), but it's bit.trip Runner so I can't really complain. Glad that it's found a home where it belongs. I absolutely loved Runner 2. I completed the game in a span of couple of weeks. Every single piece of gold and perfect cannon shot in every stage on every difficulty. And I still couldn't stop at that. I kept replaying stages for a while because it was so much fun. Guess ill be running alot on the switch. Really nice surprise. I loved the 2nd one but was never a fan of the art style. This looks fantastic though. Never beat runner2 but had a lot of fun with it. This looks like it's going to be worth it, for sure. Seems like they have added a good bit to the formula. I can't wait for Runner 3! What?!! Whoa!!!!!!!!!!!!!!!! Awesome!!!!!!! Those Runner games are awesome! Nothing beats the originals but so glad this is so loyal to Nintendo.... I remember some even thought Runner 2 will skip Wii U and here we are with Runner 3 with those awesome guys again... they made WiiWare so fun, and they're still here. Ha! Runner 3 for Switch... right on. No more buying Runner 2 for Vita, buying for Wii U, having separate game saves for portable and console.... no more. @gcunit nope. Like many indie games, what you see (in the first 5 minutes) is pretty much what you get. So this is an auto-runner, right? Your input is exclusively relegated to jumping at certain times? I did not like Runner 2 near as much as the original and its classic, arcade-oriented spirit. What I see here is more of 2, which is ok but it does remind me of being disappointed in the aesthetic in that it was nice and different than the original, but not necessarily as compelling and adding little to the actual game. Made me wish at the time they went for a more 3D perspective or something to freshen up the formula being that I preferred the levels of the first. Runner 3 definitely looks to be much more dynamic and that's awesome to see. I hope they mix it up a bit in other ways as well. I got really excited after reading this and watching video cause I just started playing through Runner 2 again this is gonna be my fourth play throuh, last night and the crazy part was I was wondering about when and if they were ever gonna do another one, guess I got my answer and it looks off the chart awesome, I cannot wait for this DAY ONE purchaser right here. Loved the Bit Trip games on Wii it would be amazing to see some of the other titles in the series get their long over due sequels . While I very much enjoyed both 1&2, I liked the original aesthetic more than the modern look of 2. However, this takes that modern look to a whole new beautiful level. You know what I miss and what the Switch really needs? Loved the original, but Bit. Trip Beat was an even better game for me personally. Put that on Switch too. In fact, put all the Bit. Trip games on Switch. I've played a fair amount of Bit. Trip Saga and really liked the retro style, but this is looking so darn pretty I don't think I'll miss it. @Ralizah Jumping and sliding, yeah. Super yay. Though all this cool indie news has me much more trepidatious about that little olde 32 gigs. I need some SD cards with pictures of Animal Crossing characters on them to make me feel better about life. Is that a thing anywhere? I see cartons of milk moving towards me and looking like they just drank themselves before they checked the expiration date. I'll check it out when it dips under $10. Not really willing to spend more on an auto-runner. I am soooo getting this. Absolutely loved Runner 2. This being an exclusive makes me actually feel a lot better about my switch pre order. So this is exclusive? Good to hear. The second one was really good, this looks promising too! The shifting of the view will be something to get used to, but it shakes up the formula. Commander Video strikes again. Can't wait for this one. I love these so great news! This is one of those games I go back regularly. I bet it's a timed exclusive. Regardless, this is a good addition to the Switch catalogue. I look forward to its success. @MrMustafa Please tell me that's a real character name. If it is, I'm 100 percent sold on this game. @NotBatman_01 She's in Runner2. My favorite character bar none.